[ Margot Asquith, socialite and author, wife of Liberal Prime Minister H. H. Asquith. ] Autograph Note Signed ('Margot Oxford') acknowledging receipt of a letter and a book. On letterhead of 44 Bedford Square, WC1 [ London ]. 13 February 1936. 1p., 12mo. In good condition, lightly aged. Reads: 'Thank you very much for yr. letter & the book | Yrs | Margot Asquith | 13 Feb 36'. [ Cynthia Asquith; J.M. Barrie ] Autograph Note Signed "C. Greene" [Cynthia Asquith] to Morley Stuart, Editor, "Cambridge Daily News", Barrie's response to an article in the newspaper about his change of hand for writing. With related clippings etc. Cynthia Asquith ("C. Greene"), Secretary to J.M. Barrie, wife of Herbert Asquith, the PM's son. [Headed] Adelphi Terrace House, Strand, W.C.2, 1 February 1937. ANS, one page, 12mo, good condition, saying "I am asked by Sir James Barrie to thanmk you very much for a nice letter and an interesting article. | Yours daithfully | C. Greene | (For Sir James Barrie)". Accompanied by: a. newspaper clipping about "Barrie Handwriting Contrasts" - Barrie's change from right to left (because the right 'gave out') illustrated and discussed; b. a small clipping entitled "Sir James Barrie's Last Autograph", with detail and illustration; c. Typed Statement concerning "The Mysterious C.
[ H. H. Asquith, Prime Minister. ] Autograph Signature ('H. H. Asquith'). On 3 x 9 cm piece of card, cut from the end of a letter. Reads: 'Yours sincerely | H. H. Asquith'. In poor condition, heavily creased and marked. [ Raymond Asquith, son of Prime Minister H. H. Asquith and member of 'The Corrupt Coterie'. ] Two Autograph Letters Signed (both 'Raymond Asquith') to 'Dummett' [ Sir Robert Ernest Dummett ], regarding speaking at a political meeting. The first on letterhead of 1 Paper Buildings, Temple, EC [ London ]. 14 December 1908. The second (with mourning border) on letterhead of 49 Bedford Square, WC [ London ]. 8 January 1909. Both items in fair condition, with light signs of age and wear. ONE: 2pp., 12mo. He complains of having done 'no political speaking for 2 or 3 years now', and of being 'a poor hand at it even when in practice'. Dummett is nevertheless invited to 'command' him on 29 January. TWO: 3pp., 12mo. Circumstances having arisen, he has to apologise for 'crying off'. He is certain that 'in the 3 weeks which remain' Dummett will have 'no difficulty in securing a substitute who will be much more effective'. From the papers of Sir R. E. Dummett. [ Herbert Henry Asquith, Liberal Prime Minister. ] Autograph Note Signed ('H. H. Asquith') to W. J. Fisher, agreeing to join a committee appealing for help for the family of Harold Frederic. On letterhead of 20 Cavendish Square, W. [ London ] 15 November 1898. 1p., 12mo. Bifolium. In good condition, on lightly-aged paper. Reads: 'My dear Sir, | I shall be very happy to be one of the committee who are to appeal for help for the family of the late Harold Frederic.' The letter relates to a Victorian scandal. In 1884 Frederic (1856-1898) had come to England with his wife and five children as the London correspondent of the New York TImes. He set up a second household with Kate Lyon, with whom he had a further three children. Lyons was a Christian Scientist, and when Frederic suffered a stroke in 1898, she tried to cure him by faith healing. [ Herbert Henry Asquith, Liberal Prime Minister. ] Autograph Signature.('H. H. Asquith'). On 4 x 9 cm piece of paper, cut from the conclusion of a letter. In fair condition, lightly-aged, with minor traces of black paper mount on reverse. Reads 'Yours very truly | H. H. Asquith'. [ Herbert Henry Asquith, 1st Earl of Oxford and Asquith, Liberal Prime Minister. ] Autograph Document Signed ('Oxford & Asquith'), ' a word of greeting to the students of the University of Glasgow'. 2pp., 12mo. In good condition, on lightly-aged paper. The document is possibly a draft, as it contains a couple of emendations. Describing himself as 'an old Lord Rector of 20 years' standing' (he held the post from 1905 to 1908), he praises the University's 'great traditions, which have been maintained & enriched by many generations of their predecessors'. He urges them to 'carry on the torch which has been handed down to them, and to keep their famous University in its place in the forefront of the vangard of the <?> of Culture & Science, to which Scotland & the Empire owe so much'. , Indian Guaranteed Railways.] Two Autograph Accounts by Sheena Tennant of a tour with Maitland across India in a private railway car, encountering Bhupal Singh of Udaipur and Pratab Singh of Idar. India [including Calcutta, Darjeeling, Benares, Lucknow, Cawnpore, Agra, Jaipur, Lahore, Peshawar, Delhi, Bombay]. Two volume account: 29 November 1912 to 27 January 1913. One volume account (in 1913 Asprey's Diary): 1 January to 1 March 1913. Sheena Lilian Grant Tennant (hereafter ST) came from a privileged Scottish family, being the youngest of the six children (five daughters and a son) of wealthy industrialist James Tennant of Fairlieburne, Fairlie, Argyllshire, a nephew of Sir Charles Tennant of the Glen (father of Margot Asquith, wife of British Prime Minister H. H. Asquith, who was hence James Tennant's cousin). Beginning as a partner in the Glasgow chemical manufacturers Charles Tennant & Co., James Tennant became director of companies including United Alkali Co, North Eastern Electric Supply Co, and Eastern Paper Mills Co.
[Sheena Tennant, Margot Asquith's cousin.] Autograph Notebook, containing a record of 'Concerts, Theatres etc' attended by her in London between 1916 and 1918. 'Sheena Tennant | 49 Wimpole Street | W. [London].' Between 4 January 1916 and 1 October 1918. An interesting piece of First World War London social history107pp., 12mo. In good condition, on aged paper, in aged and worn black cloth notebook. On first page: ''Sheena Tennant | 49 Wimpole Street | W. | Concerts, Theatres etc | 1916'. Carefully and neatly compiled, with the date, theatre, production, and often the cast and the names of those she went with. [Sheena Tennant, Scottish composer and Margot Asquith's niece.] Collection of six items of printed sheet music, all piano pieces by her, including arrangements of poems by W. B. Yeats; Alfred, Lord Tennyson; W. E. Henley; David Doyle. All published by The Frederick Harris Company, London (either at 85 or 89 Newman Street, Oxford Street; or 40 Berners Street). Collection of six items of printed sheet music of piano pieces. In good overall condition, on lightly aged and worn paper. All published by The Frederick Harris Company, London (Item One at 89 Newman Street, Oxford Street; Items Two to Four at 89 Newman Street; and Items Five and Six at 40 Berners Street). All items excessively scarce, with COPAC only recording one copy (at the British Library) of Items One, Two, Three and Five; two copies (British Library and Trinity College Dublin) of Item Four; and no copies of Item Six. ONE: 'Now Sleeps the Crimson Petal. Song . [Sheena Tennant, niece of Margot Asquith.] Large collection of original autograph sheet music by 'one of the first women composers' (she studied under Nadia Boulanger), together with eight printed piano pieces by her. Manuscript material, dating from between 1902 and 1933, mainly from Fairlieburne, Fairlie, Argyllshire, Scotland. Seven of the printed scores published by The Frederick Harris Company, London, 1912 to 1929. The other by Augener Ltd, London, 1908. The collection comprises a large collection of autograph sheet music, together with copies of nine published piano pieces. Accompanying the collection is an autograph note by Sheena Tennant's son Hugh Kendall: 'These books, with accompanying score sheets, represent something rather unusual - the compositional examples of my mother, aspiring as she did to be what she saw herself as - one of the first women composers. [Nadia Boulanger.] Eight pages of Autograph musical annotations and text in French, at the start of a notebook containing the musical scores of several pieces by her pupil Sheena Tennant (including 'Sarabande' and 'Pluie d'Ete'). Undated, but at Clichy, Paris, France, between 1909 and 1911. 6pp. by Boulanger, out of 46pp. in a landscape 14.5 x 23 cm notebook of printed staves, stitched within plain white covers. In fair condition, lightly aged and worn, with five leaves loose and a sixth leaf with loss to one corner. Eleven pages in ink (all by Tennant), the other 35pp. in pencil. In pencil at head of front cover: 'Lundi 4 h.' The initial three leaves (the third of them loose) carry the six pages of musical composition and text by Boulanger; the rest of the volume (40pp.) comprises musical composition by Tennant. [Herbert Henry Asquith, Liberal Prime Minister.] Autographh Signature ('H H Asquith') on envelope, franking a letter to Quintin Hogg. H. H. Asquith [Herbert Henry Asquith, 1st Earl of Oxford and Asquith] (1852-1928), British Liberal Prime Minister, 1908-1916. Home Office, Whitehall. Envelope with London and Brighton postmarks, 10 March 1893. 10 x 13 cm envelope. In fair condition, aged and worn, with damage and loss to back flap.. Asquith has written out the address as follows: 'Quintin Hogg Esq | 5 Cavendish Square | W'. The last two lines have been crossed out, and the address amended in another hand to '56 Westbourne St | West Brighton'. The front of the envelope has a square London postmark in black ink, and circular frank in red; the rear has two more postmarks (one London and the other Brighton. The flap has 'Home Office | Whitehall' printed on it. [Henry Herbert Asquith, Liberal prime minister.] Autograph Letter Signed ('H. H. Asquith') to C[lement]. Hoult, declining to become president of 'the Committee of your Society' [the Wolverhampton Literary & Scientific Society]. On letterhead of St. Salvador's, St. Andrews, Fife [Scotland]. 18 August 1901. 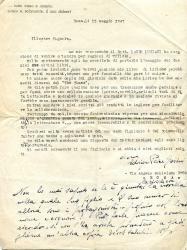 Three Typed Letters Signed (the first two in full and the third 'E P Gorini') the first two to Violet Bonham Carter and the last to her son Mark, the first in English and the last two in Italian. 21 February 1946; 15 May 1947; and 28 July 1948. All three from Via Angelo Poliziano No. 69, Rome. Text of all three items clear and complete. All three on lightly aged paper, creased and with some wear to extremities. 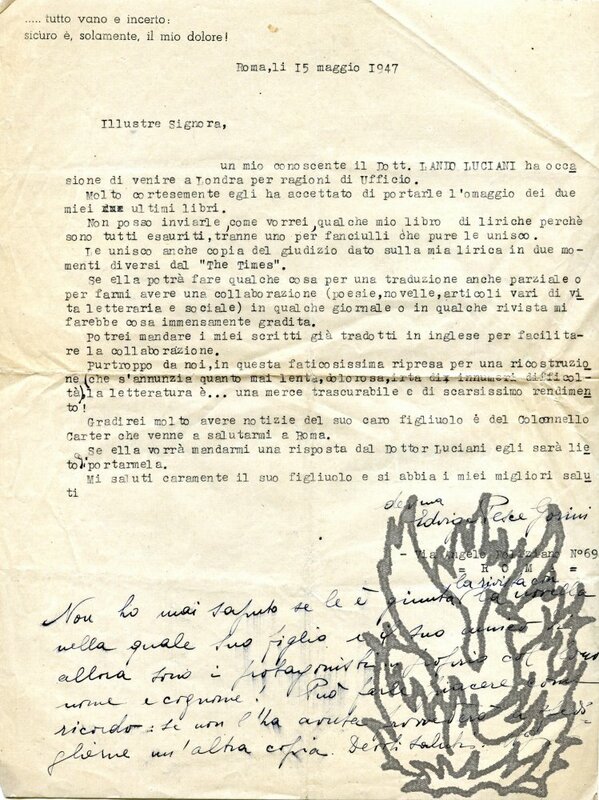 Letter One (8vo, 1 p; 20 lines of text): She thanks Bonham Carter for her 'kind and appreciative letter' and 'will see that through the English Embassy' she receives 'a copy of my short story: "I due prigionieri", of which your son is the protagonist'. (An officer in the Grenadier Guards, during the war Mark Bonham Carter had escaped from a prison camp in northern Italy.) Describes material she is sending relating to her 'literary career'. Two Autograph Letters Signed ('M Asquith' and 'Margot Asquith'), both to the Editor of the London Daily Graphic Harold Edward Lawton. 3 and 8 December 1920; the first on letterhead of 44 Bedford Square, London W.C.1, and the second on letterhead of The Wharf, Sutton Courtney, Berkshire. Both items written in pencil and good, on lightly aged paper, with their stamped and postmarked envelopes addressed by Asquith. Both envelopes with traces of brown paper mount adhering to reverse, and both docketed by the Graphic's editor 'To me Harold Lawton'. Letter One (12mo, 4 pp, headed 'Private'): Amusingly outraged letter regarding a visit by 'two gentlemen' of whom Asquith 'had no sort of knowledge'. Graphic journalists, they assured Asquith 'that nothing wd. be written about me without my seeing it first [last five words underlined in red]'. Autograph Card Signed and Autograph Note Signed (both 'Margot Asquith'), both in French, to unnamed male correspondent ['Cher trest Cher Coq']. Card 1 July and Note 3 July [both no year, but before 1919]; both with printed address '20 Cavendish Square, W. [London]'. Three Typed Letters Signed to Morley Stuart, Editor of the Cambridge Independent Press; together with photograph and press cuttings relating to Montagu, with letters from Asquith's and Lloyd George's secretaries. 1915 to 1924; from various places. British Liberal politician (1879-1924), Secretary of State for India, 1917-22. Jewish opponent of the Balfour Declaration. Untidy collection, discoloured with age and crudely mounted on leaves taken from autograph album, with cuttings pasted over parts of letters, etc. All three of Montagu's letters signed 'Ed S Montagu'. LETTER ONE (9 February 1915, 24 Queen Anne's Gate, S.W., one page, octavo): Is grateful for a letter and cutting.